Sometimes it takes a long time for things to resolve. Life moves faster than that, of course, but the emotional and psychological scars take a long time to heal. The damage, that takes but a moment to be inflicted, can take years before resolution truly occurs. For me, the resolution has been in the works for longer than it probably should have been. And the last bit of resolution is probably one I will never get; I will never be able to tell him I’m sorry. I don’t regret ending things, but I do regret just how much it hurt him. This is going to be a really long post, and I don’t have photos to put in it because I deleted every single photo that relates to this time of my life. And threw out the artwork related. I even deleted all evidence from my backup drive. However, I managed to find a few photos on my mom’s computer. Proof that it really happened. It began when I was a junior in high school, and ended when I was a junior in college. And in those five years, a tragic romance unfolded. Had Romeo and Juliet survived, I imagine they would have been just as doomed as Ryan* and I were. Star-crossed lovers is the term. Two people whose lives cross for but an instance in the scheme of time, and in that moment, burn brighter. The moment passes, and despite the love shared, it does not endure. It can’t endure. We were in marching band at different high schools, both suburbs of the same city. As such, our sports teams competed, and since that included football, our marching bands crossed paths. In the competition world, our marching bands almost never took the same field, since we did different circuits. But it was at the football game between our rival schools when we were both sixteen that we met. During third quarter, the marching bands get to socialize and have refreshments with each other. It’s a neat time to meet other people. Since I wanted to meet horn players from that band, I sought them out, and met one. A friend of his, and several guard girls from my school were part of this, and I found out that his friend was both a horn player and one of the drum majors for their band. Excited to meet other horn players, I managed to get the first guy’s number. Unfortunately for me, the guard girls had been hitting on him, and he assumed I was part of that later on, and decided that I was a psycho, thanks to the drum major horn player friend of his. It ends, the time our stars were aligned, with a conversation on his 21st birthday. Or at least that’s the last time I remember talking to him. There were a few other incidents involving him showing up to my house and me hiding locked away in my room because I just wanted it all to be over. All after two months worth of him showing up at my university outside of my classes and apartment several times a week, to the point of me often hiding and a friend in the Marines offering to beat up Ryan. Everything between us was a mess that had already damaged us beyond repair by the time his birthday rolled around. It was hard to talk to him that day, May 9th, because we didn’t know how not to be in love with each other. Separating our friendship and our romance was impossible for him, thus leaving me in a place where I couldn’t even be around him or talk to him. It was a disaster. He was talking about some of his friends from high school taking him out to a bar, and how honestly it wasn’t that exciting, and he wished I could have been there. But he knew that we needed to spend time apart. The problem was that mentally he knew this but emotionally he didn’t, and a lot of messiness ensued. For me it was terrifying, and I have to believe that it was for him as well, but for the very opposite reason it was for me; I was afraid I would never escape him, and he was afraid I would. The second time I saw Ryan, it was during the winterguard/winter drumline season, again while we were juniors. It was the only year I did winterguard, oddly enough. In any case, at a major local competition, my guard had performed and were sitting on the bleachers watching other guards perform before awards, and his drumline happened to be sitting in front of us, watching their high school’s guard perform. I recognized him, and while the other guard girls were all gossiping about who they thought was the hottest, I was busy being the brave one that was cool with moving down a few rows and striking up conversation with the drummers. Lo and behold, Ryan was sitting right in front of the guy I had plopped down next to just to prove a point to the other girls in my guard. And so I started talking to him instead. We broke up in early March. I had just come home from the Olympics in Vancouver, the last bit of which we had been fighting long distance. He had grown up in a house where his dad was the dominant personality, and his kind mother was glad not to be the one in control. So naturally Ryan gravitated towards being in control and me taking the back seat, whereas I am hardheaded and a very dominant sort of person. We were always butting heads over this, and his need to be in control of my life had spiraled to a dangerous level. All the warning signs I had been too blind to notice were suddenly clear as day, and I knew beyond a shadow of a doubt that we weren’t meant to be together. That no matter how hard we had tried to make things work, no matter how much we loved each other, that we were wrong for each other. It was a saturday, and we were supposed to go ice skating at UK together, but when I arrived at his apartment and we got into his car, the fighting continued, and one drive around the block later resulted in a long night in which I became scared of what he would do to himself now that he knew for sure that this was the end. Somewhere in the fight he pulled out the engagement ring he’d bought while I’d been in Canada and tried to show it to me, but I closed my eyes and held them shut for a long time. To this day I have no idea what that ring looked like, nor what happened to it. The third time we met, it was at another football game. This time, our senior year of high school, and I had already developed a minor crush on him, after having met him twice. Determined not to let possibly my last chance pass me by, I stowed a sharpie in my uniform and during third quarter, tracked Ryan down and got his number. He was the head drum major that year, and trust me when I say the allure of being the soloist from my school and being like psh of course I’m friends with that school’s drum major was a big one. There’s a funny story this time from how that first horn player I’d met the year before was desperate to avoid me because he was still convinced I was psycho. Christmas of our junior year of college, we went engagement ring shopping over break. Just a few locally owned jewelry places, and I remember looking at rings and being beyond excited about our future together. I was going to get engaged to the man I was madly in love with, and we were going to get married right after graduation. I’d picked out a few weekends in late May and early June and we were tossing around what we thought would be best. One summer, we had gone to a local Arboretum, and Ryan and I knew we were going to have an outdoor wedding there. For our honeymoon we were going to go on an Alaskan cruise. Looking at the rings, getting sized, made the whole thing palpable. Our future was set and we were blissful. Burned into my memory is the first time we ever hung out. Senior year, I was over high school. So instead of going to homecoming, I used my one free weekend between August through November to hang out with Ryan. Since he’s allergic to cats, we ended up hanging out at his house. I’m not entirely sure how I managed to convince him of this, but I guess it was the same way I managed to get his number. And like every guy I’ve ever known and wanted to be friends with perhaps too aggressively, he made the preemptive strike of “I don’t want a girlfriend and I’ll never be interested in you.” I assured him I wasn’t looking. He would later tell me he could tell I was lying through my teeth. We watched V for Vendetta, which oddly enough I had seen that past spring with the guy who took me to my junior prom. Through the whole film, Ryan paid no attention to me, whereas I was painfully aware of him. Crushes tend to be like that. That was also the day I met his parents. When we eventually started dating, Ryan had to explain that I was the weirdo they’d met a year ago and all that fun stuff. The following monday at school, everyone was asking me what on earth I did over the weekend because I was glowing with happiness. So I eagerly told them about hanging out with Ryan, the head drum major for X school. The reaction was exactly what I waned: awe. The fall of our junior year, Ryan transferred to UK, claiming that he liked the music program better there, and especially the horn teacher. When I broke up with him, he claimed he transferred just to be with me. All I could see was that it meant at some point he had lied to me, although in reality, both reasons were probably true. Being 30 minutes away from each other, we spend an absorbent amount of time together. My social life at my university dropped to basically none. I skipped out on anything and everything to be with Ryan and his friends–all other horn players at UK. It got to the point where I would hang out with those girls (yes, all girls) without Ryan, even though they were his friends. Truth was, my relationship with Ryan had already destroyed almost all the friendships I had, or prevented them from growing into actual friendships. That fall I had my junior recital, Ryan being one of the four horns in a horn quartet piece that ended my recital. It was an arrangement of “Because” by The Beatles. Across the Universe was our favorite movie, and I loved that song, so of course I wanted it in my recital. That fall Ryan was also constantly on my case about religion. We both grew up religious, but he had “outgrown” it, and was always annoyed that I still believed. Any time religion came up, he took the time to try to prove why it was wrong and why I was an idiot for believing. I just accepted that this was a part of who we were as a couple, even though it hurt. Ryan developed this way of tearing me down and building me up that left me dependent on him emotionally. And I let him. That fall, it was the strongest it would ever be. We IMed constantly senior year. I would watch impatiently for him to sign on, and then often force myself to wait a minute or two before pouncing. Turns out he was terrible at english, and since I was in AP, I would edit his papers for him. The tradition would continue on into college. The first time I edited a paper for him, he kept urging me to hurry up, but I said I was being thorough. I was, actually. I’d never read the book his paper was on, Beowolf, so I judged his arguments on whether they made sense to me or not. When I found out how he did on his paper, he started by saying the english teacher basically chewed out the entire class for all-around terrible essays. He, however, had a 97% on his. So I would help him with english from then on, and he would help me with horn/music stuff. I talked about auditioning for Glassmen, and he was the person I was most excited to tell I’d been offered a spot in the winter of my senior year. We talked about drumcorps a lot. Summers all blur together for me. We had two summers of bliss together. The first one was the only time we really had to grow our relationship not long distance. Every second of every moment together was precious. The second one, in which we knew he was transferring to UK and would be close to me, was different. We would go roller blading round his neighborhood, he tried to teach me to drive stick (I still can’t), we would play soccer at a park two streets away from his house. We went everywhere together, and any time spent apart was heartbreaking. His presence was like oxygen to me. My dependence on him should have been terrifying to me, but young love is so all-encompassing that I never noticed. Generally when we were together, it was at his house, and Ryan was very rarely around my family because he didn’t like them. Again, it should have been a warning. Although, we didn’t hang around his friends much because I didn’t get along with them. We squabbled like an old married couple, and generally ignored the bigger issues. We’d get to those when they came around. Probably though, we avoided them because if we ever faced them, it could easily end the relationship. Blinded by our love for the other, we never truly even knew we needed to face the big issues. We didn’t hang out for the rest of high school. One night at Glassmen during move-ins, I was feeling exceptionally down, so I thought I’d try calling some friends. Neither of my best friends answered, so on a whim, I tried Ryan. Who answered. I found out he’d be on tour with the Cavaliers that summer, and that was the moment everything changed. I still had a crush on him that despite my dire attempts to suppress it, had never disappeared. Upon arriving home from tour, my best friend at the time, Amy, came to the airport with my mom and sister to welcome me home, and couldn’t wait to tell me the news: Ryan had called me. THE Ryan, the one I had gushed about all senior year. So I bashfully told her, uh, yeah, we’re sort of dating now. And so that summer, every time Glassmen and Cavaliers were at the same show, we found each other and hung out. If I showed up by their buses, the guys knew who I was looking for, and if Ryan showed up by ours, people knew to find me. We were friends, and for a while on tour, my crush on him went away. I almost started dating Danny, another gmen mello. People all thought I would. But then finals week in Pasadena, all those feelings, after having not seen Ryan in three weeks, became real. And finals night, after the awards ceremony and after we had all gotten out of uniform for the last time, Ryan found me. And before he had to run off, and before I had to leave as well, he kissed me for the very first time. I would have never guessed that the single kiss I wanted the most would turn out to damage me so much. We were doomed from the start, but we could have never known that. You can only try to force a square peg in a round hole for so long, before both are damaged and you eventually learn that it’s impossible. In some sense, the day I broke up with him was like Romeo killing himself, and Juliet being forced to deal with the aftermath. Does she move on, or does she let the heartbreak kill her? We were star-crossed, Ryan and I, and for nearly three years, we were madly in love. But our paths were never going to stay together. They couldn’t. It has taken me years to undo the damage that relationship did to me. And it has taken me this past year (a whole year) to go from the moment I forgave myself and knew I would be loved again someday, to the moment where I can finally forgive him. Up until recently, the bitterness of the relationship and the horrific way it ended were all I could see. I wish I could explain things to him. I wish I could tell him I’m sorry. 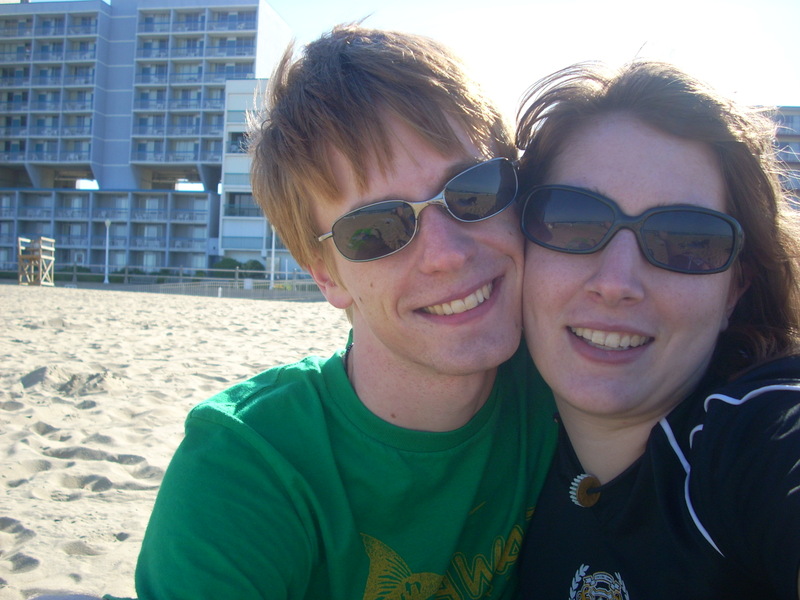 Also, that’s one of two remaining photos of us together. No, seriously. Two.